Trace metals are fundamental components of various biochemical reactions for phytoplankton. They serve as micronutrients and therefore play a key role in marine biogeochemical cycles. International programs such as GEOTRACES require fast, sensitive and reliable methods for the simultaneous analysis of multiple trace elements in seawater. 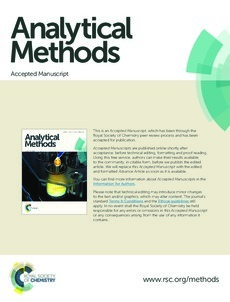 This paper reports the development of a simplified, automated, low cost, portable, off-line extraction method with high sample throughput. The extraction uses the chelating resin Nobias-chelate PA1 offering an extraction factor of 18 from 27 mL of seawater. This solid phase extraction has been coupled with Sector Field-Inductively Coupled Plasma-Mass Spectrometry (SF-ICPMS) for analysing dissolved manganese (dMn), cobalt (dCo), nickel (dNi), copper (dCu), cadmium (dCd) and lead (dPb). An optimum pH of 6.2 was selected allowing quantitative recovery of most elements of interest, offering stable Cu and minimum molybdenum (Mo) recoveries, limiting interferences of Cd determination. Picomolar or subpicomolar trace metal blank concentrations and detection limits were obtained suitable for open ocean sample measurements. Regular analysis of reference seawater samples (SAFe, GEOTRACES and in-house seawater) showed excellent short-term and medium-term precision (1� RSD) and accuracy of the method. Twenty four samples, 3 blanks, 6 standard addition calibration samples, 3 replicates of in-house seawater and 2 reference seawater samples were extracted daily. The method has been successfully applied to the analysis of seawater samples from the Southern and Pacific Oceans.